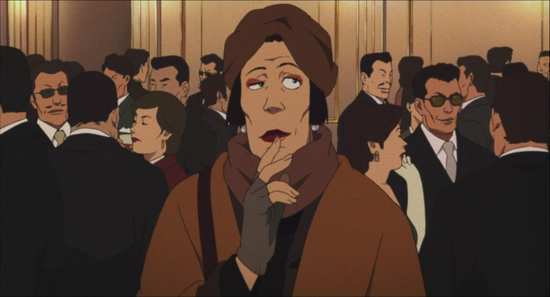 I didn’t think that I’d be watching Tokyo Godfathers again within the space of six months, and I certainly didn’t think that I’d be reviewing it again. When Manga Entertainment announced that they’d be releasing Satoshi Kon’s Christmas masterpiece on Blu-ray, I didn’t think much of it at the time, apart from the grumble that once again, a UK release had been announced while my imported version was still in the shrinkwrap. I thought that Manga would do what they did with the Cowboy Bebop movie, simply reuse the Australian master from Umbrella for their domestic release. The Australian release of Tokyo Godfathers on Blu-ray wasn’t all that spectacular, but it was the only game in town if you wanted the film in something approaching HD. Severely windowboxed, with lossy audio and unpleasant subtitles, it was one of those discs that would do until something better came along, with the expectation that at this stage in the physical home cinema market, something better probably wouldn’t. Expecting the same again, I put the Manga check disc into my player... and couldn’t contain the grin that spread across my face. I had to review this one. Christmas is much like any other time when you’re homeless, and it’s no different for Gin, a down on his luck gambler, Miyuki, a runaway teenager and transvestite Hana. But things begin to change for them when they find a baby abandoned at a rubbish tip. They take pity on the poor child, and decide to return her to the mother. Their journey takes them on an adventure through the city, and while they try to accomplish this Christmas miracle, the baby may be the miracle that brings light to their own bedraggled lives. It’s been fixed! Manga Entertainment’s Blu-ray release of Tokyo Godfathers gets a 1.85:1 widescreen 1080p transfer, a transfer that is properly full screen with no windowboxing at all. Trying to zoom into the postage stamp image of the Australian release essentially meant that you were scaling it up, but the Manga release is properly high definition. The image is clear and stable, and while it looks to be sourced from the same print as all other home video releases, it’s clean of print damage, and there’s no sign of digital artefacts. I still think the print could have used some restoration, as the image can be soft, dark detail is lacking, and blacks tend to grey, suggesting a gamma push. But it is a properly filmic image with grain apparent throughout. With the film finally filling the screen, you can see the lush world design, the wonderfully observed characters and the delightful animation as good as you’re going to see it. Tokyo Godfathers really is a joy to watch on this disc. It’s a joy to listen to as well. Manga have sourced proper lossless audio for the film, in both DTS-HD MA 5.1 Surround and PCM 2.0 Stereo Japanese format. I went with the surround, and was delighted by the aural experience. It’s an organic and immersive surround track that really makes the action sequences work well, while filling the room with the film’s quirky music soundtrack. The dialogue is clear throughout, and the subtitles are accurately timed. Speaking of the subtitles, Manga use their stock font here, decently sized, off-white and perfectly legible subtitles. I didn’t notice any typos this time. The only nit to pick is that the end theme song isn’t translated. The disc boots to an animated menu. All of the extras are presented in 1080i 50Hz. 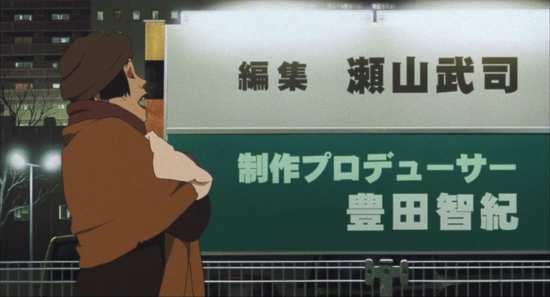 Unexpected Tours lasts 25:57 and Process of Animation: The Making of Tokyo Godfathers lasts 14.02. Both are making of featurettes, and offer interviews with the cast and crew, including Satoshi Kon. 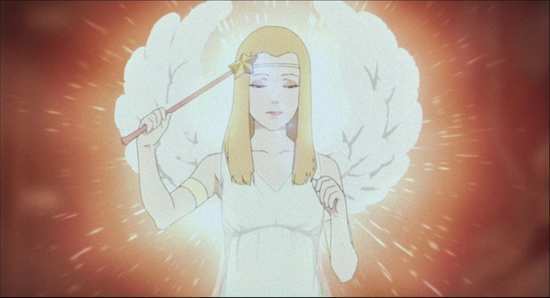 Animax Featurette (Big Apple Anime Fest 2003) looks at the film’s US premiere for 22.09, and offers one of those stage events. 5.1 Surround Sound Art Gallery & Interview with Music Director: Keiichi Suzuki lasts 11:52 and does what it says. It’s also the only goof on the disc; the name says 5.1 Surround, but the audio with the featurette is in PCM 2.0 Stereo. 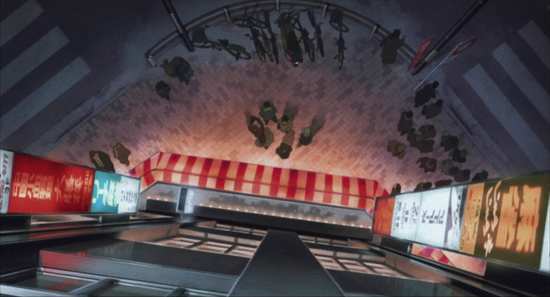 The trailers for the film which were on the Umbrella release are absent here. 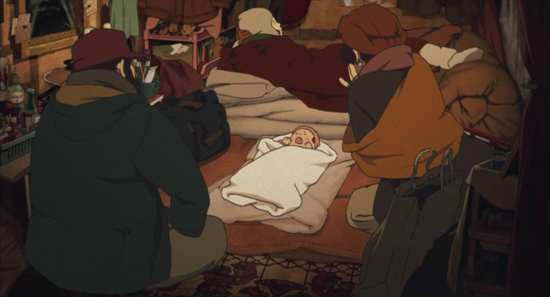 Tokyo Godfathers is by far Satoshi Kon’s most accessible work, a heart-warming and tender Christmas story that’s bound to divest the most committed of Scrooges of his bag of humbugs. Having said all that, it’s still as far from the conventional Christmas tale as you can get, without it being Easter. The story itself is a familiar one, Kon has said that he was influenced by the 1948 John Ford Western, The 3 Godfathers, which saw John Wayne and 2 other outlaws left in charge of a baby in the middle of a desert, and the motif may be familiar to fans of the computer animation Ice Age. 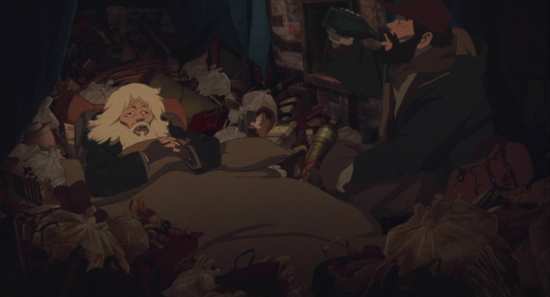 Tokyo Godfathers is very much a character piece though, and with its unlikely heroes plucked from society’s least wanted, it’s never less than compelling. The world has forgotten about these three, and they themselves have accepted their lot, wishing to fade into insignificance. For various reasons, they are escaping their pasts, although they have managed to form a surrogate family of their own. The discovery of the baby acts as a catalyst for them to deal with their problems, and begin to reengage with society. Of course with the seasonal setting there is no surprise that they begin to attribute supernatural portents with the events that occur, they begin to talk of the baby as a messenger from God, and there is occasion for Kon’s warped perspective on things to deliver a hopeful message, helped of course by Gin’s affection for the bottle. Still, this wouldn’t be a Christmas movie without at least one genuine Christmas miracle. 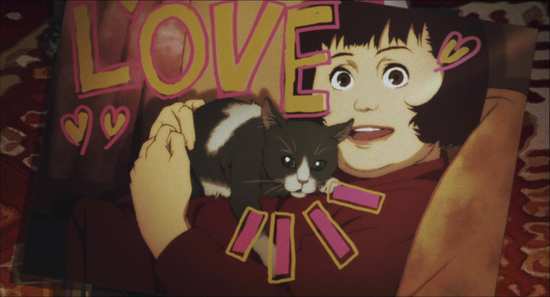 This film isn’t for younger children, the 12 rating is indicative of that, and while Satoshi Kon is renowned for mind-bending perspectives on subjects, he isn’t one to sugar-coat them either. There is no way of showing the plight of the homeless in a wholesome and uplifting way without descending into the saccharine. 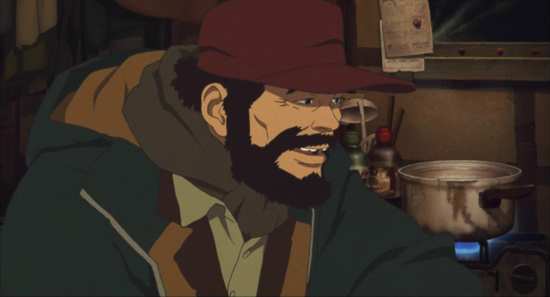 Tokyo Godfathers remains honest and forthright when it comes to its characters, and that means warts and all. But that makes the empathy that develops for them all the stronger. If you are tired of The Sound of Music come Christmas Day, you could do worse than watch Tokyo Godfathers instead. It hits all the right emotional notes, playing those heartstrings like a master harpist. It’s dramatic, uplifting, and funny, with just the right amount of tragedy and hope. 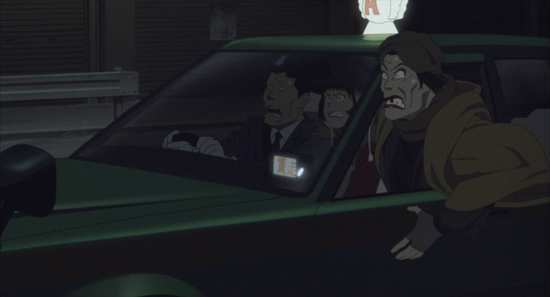 The sublime animation is truly a joy to watch, and Satoshi Kon’s vision of the forgotten half of a city at Yule is utterly memorable. 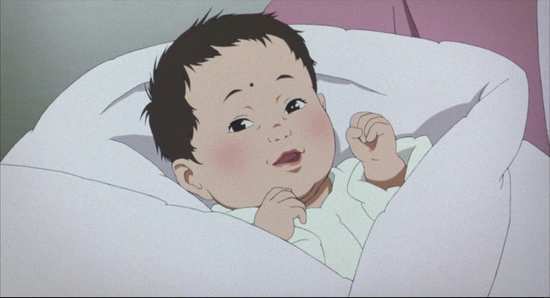 Every time I watch Tokyo Godfathers I love it more and more. With the Australian release, my love for the movie outweighed my disappointment with the disc, but the 10 I gave it was grudgingly given even so. 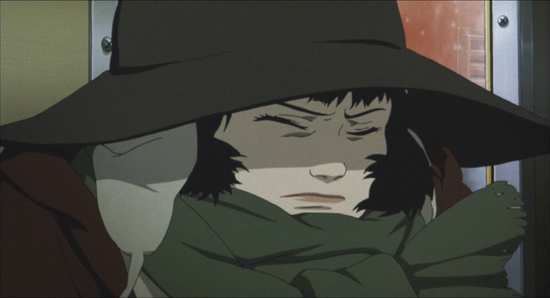 There’s nothing grudging about my appreciation for Manga’s release of Tokyo Godfathers. You are not going to experience this film looking or sounding better without a full-on restoration and re-mastering of the original print. The film looks even better on this disc than it did when I saw it in the cinema! Don’t deprive yourself of this Satoshi Kon seasonal gem. That’s the only criticism I have of this disc; Manga released it two months early!